In her recent successful defence of her PhD thesis, Rita Lambert argued that peripheral urbanisation in Lima, Peru, is not ‘outside’ or a ‘failure’ of planning but is produced and regulated within planning. Her research demonstrates that the rationalities of different actors do not always conflict but also conflate which in turn explains why this mode of urbanisation is sustained. Rita contends that focusing on moments where interests align can provide a rich area for theory building and future research surrounding the politics of planning in contested Southern contexts. Notwithstanding that the peripheral slopes have been declared uninhabitable high-risk zones by the State, their occupation is occurring at an unprecedented rate, exposing an increasing number of inhabitants to hazardous living conditions. 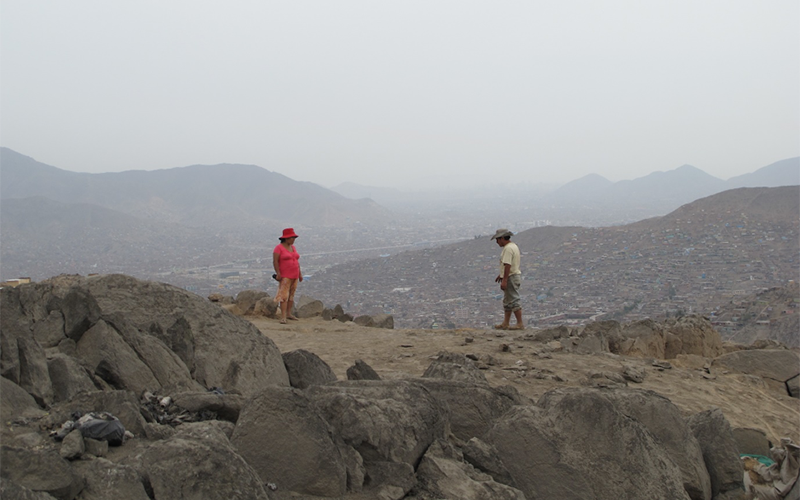 These developments of the slopes of Lima are often referred to in official discourse and the media as an informal/illegal process driven exclusively by the urban poor. However, a close examination of such process defies its understanding as occurring beyond the State, in violation of planning laws, or in the exclusive domain of the poor’s agency. Instead close engagements with regulatory frameworks and spatial outcomes compliant with planning norms are central features, since such practices shape local dwellers' entitlements to basic services, as well as their expectations on securing tenure. Borrowing from actor-network theory and institutional ethnography, her research takes a relational and socio-material perspective. Acknowledging that peripheral urbanisation occurs through a transversal logic, the thesis focuses on cartography - the maps and plans used on the slopes of Lima- to provide a transversal reading across 'black boxed' actors such as the 'State, 'communities' and 'land traffickers', and observe the engagement with the regulatory frameworks. Through an ethnography of cartographic practices, the thesis provides a novel methodology for bringing into view the processes, practices, alliances, and agency which are often invisible to policy makers, yet structure outcomes. Rita argues that planning research could do more to consider the technical as much as the political aspects of planning and interrogate the agency of materiality in urban processes. She demonstrates that peripheral urbanisation and planning need to be considered as socio-technical assemblages that have numerous and unexpected ways of interlinking. Unintended consequences, such as the production of risk, are outcomes of these assemblages. For policy makers and planners, a better understanding of the socio-technical configurations can guide their actions to rearrange these toward progressive agendas. Her work provides empirical contributions to the different modalities through which settlements are established on the slopes and was able to identify the various instances, within the administrative processes from recognition to the titling stage of settlements, that create fertile spaces for the illegal activities of land traffickers that are claiming the slopes at an unprecedented scale and rate. Her research going forward will focus on better understanding the different modalities of land trafficking and developing methodologies to capture and analyse these ‘hidden’ processes and actors. Her upcoming trip to Lima will share her findings with various governmental institutions, organisations and CBO’s and aims to develop a new research proposal around this topic with the objective of formulating strategies across a broad range of actors to advance a socially and environmentally just mode of urban development.